Firstly, Thank you to all who stopped by and/or commented on my last card! It is always a delight to have vistors at the Hall. A year ago, when I received my Cricut from my uncle as a present I was a bit overwhelmed both by his generosity and also with learning how to use the Cricut (afterall I had just bought myself a Cuttlebug and was just starting to see all that could do). I cut out a lot of shapes from the two cartridges that came with the machine to play around. A few months later I still had all these shapes sitting around my table getting in the way and as I am someone who loathes throwing things away I decided to challenge myself by using as many of the shapes in cards I was making for the group of March birthdays (in 2009). I was quite pleased with the results which I will share with you once I find the images, but even so I still had some shapes left over so last October I made a very geometric card for a male relative (yes, another one of those). Not only did I use them as was, but i also used them as stencils with my Adirondack Color Wash. I thought the card came out fun and funky myself. 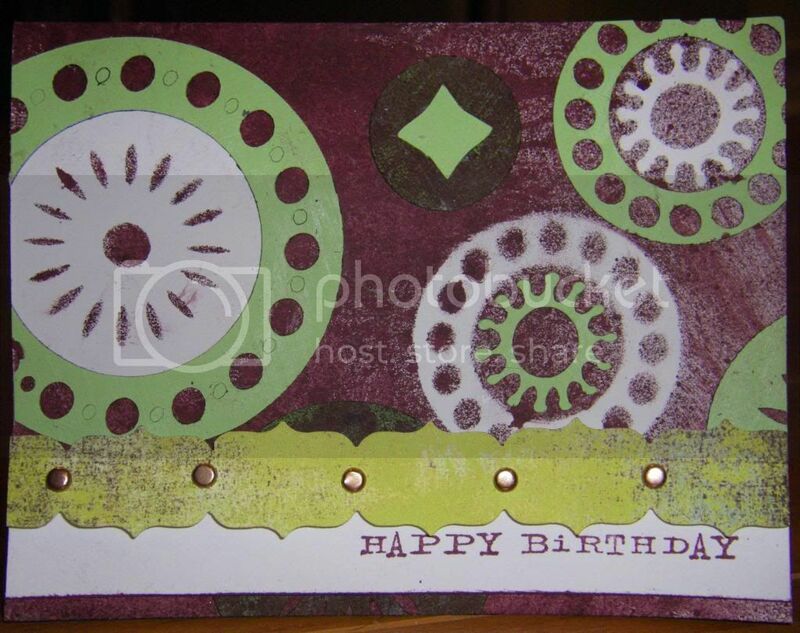 Inks: Rich Razzleberry, Stampin' Up! I like this card! Let's hope birthdays do come "round and round"! Seriously, I like the look of the "gears and sprockets".